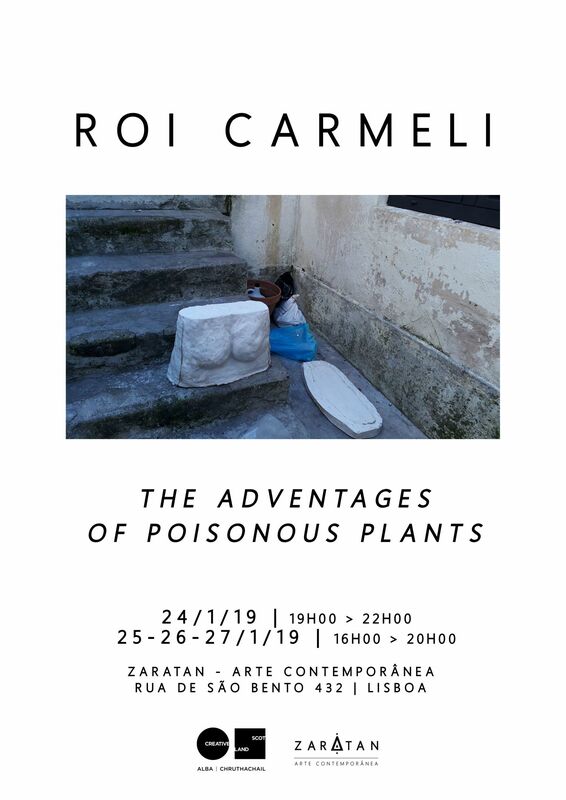 Zaratan - Arte Contemporânea is pleased to announce the opening of The Advantages of Poisonous Plants, a flash exhibition by Roi Carmeli, which presents a series of new works produced during his residency in Lisbon. BIO: Roi Carmeli is a visual artist and musician based in Glasgow. He graduated with a Bachelor of Fine Arts from the Bezalel Academy of Art and Design, Jerusalem (2010) and obtained a master degree in Fine Arts from the Glasgow School of Art, Glasgow (2015). During his education, Roi spent a year as exchange student at the California College of Art, San Francisco, as well as residencies at Corning museum for glass, NY (2012), Scottish sculpture workshop, UK (2016) and Tenjiamyama art studio, JP (2018), among other places. His work has been exhibited in Israel, USA, Scotland, England, Japan, Czech Republic, and the Netherlands. narratives. He distinctively uses sound not as background, but as a tangible material in and of itself.